At one end of the church plaza, men stirred a caldron of oil so big it could have staved off invaders at a medieval castle.Instead, it was full of frying picarel, a small fish found in the Mediterranean, which would be doled out with a chunk of bread, a wedge of lemon and a cup of Cannonau wine to locals and visitors by the hundreds. Toward the middle of the plaza on a raised wooden stage, lines of men in burgundy vests hooked elbows with women in white blouses and performed a precise folk dance to lively accordion music. And at the other end, near streets lined with vendors selling the nougat candy called torrone and balloons in the shape of pink cats, I ordered a cup of the locally brewed Ichnusa beer for 1.50 euros ($1.65) from a young bartender. “Here” was La Caletta, a beach and fishing village in northeast Sardinia, and unless she was wondering why I was paying for beer while the wine was free and unlimited, I thought the answer was rather obvious: I had come for the final Sunday night blowout of the Festa di Fatima, in honor of the town’s patroness. The streets were full of nattily dressed older couples, families with balloon-bearing children in tow, and gaggles of teenagers optimistically dressed in shorts for the May evening. If there were other foreigners there, I didn’t hear them. Why wouldn’t I be here? In the coming months, little La Caletta and Sardinia’s larger coastal resorts will swell with summer residents and visitors, most of them mainland Italians and other Europeans in search of a beach vacation. Jet-setters in yachts will cruise into the famed Emerald Coast, not far north of La Caletta. 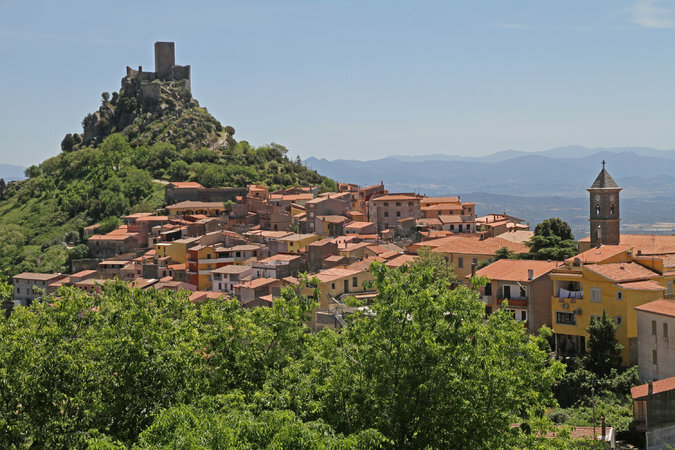 But more culturally minded visitors will find a less-explored and unique region of Italy, one accessible (often for less than $100) via direct Ryan Air flights from Paris, Barcelona, Munich and elsewhere. I went in May at the advice of my Sardinian friend Sebastian, who told me that the island’s calendar is cluttered with local festivals like La Caletta’s. But you don’t need festivals to make a visit worthwhile. The island’s landscape of wrinkled, ancient looking mountains and rugged but gorgeous coastlines is dotted with mysterious millennia-old stone structures called nuraghe. Their exact purpose is unknown, but they are unique to the island, as is the fading Sardinian language and rustic but wonderful cuisine. Even the deer (short-legged) and donkeys (striped) differ from the mainland’s. But though the second-largest island in the Mediterranean has autonomous status, its people are as gifted and gregarious hosts as those I’ve encountered on the mainland. To wit: earlier that evening, I had picked up my fried picarel and wine (double ration and two cups when they realized I was from abroad) and made friends with a group of older locals ripping apart the fish at long grease-splotched tables. And then, to my utter surprise in a town where I knew no one, I heard my name. “Seth, come eat with me and my girlfriend.” Ah, I did know one person, barely: Antonello Deiana, the owner of the modest but comfortableLocanda del Mare B & B where I was staying for 37 euros a night. He grabbed my wine and plate and led me to his table. Even when the beaches do fill up, you can escape them by taking your rental car (a necessity) into the interior. My source on that was another local, a man named Salvatore with a gargantuan belly and pudgy face, whom I met a few days later in Burgos, a 14th-century village perched on a ridge under the ruins of a hilltop castle. On my way to the western coast, I had purposefully turned off the main road to explore the countryside. The road I had randomly chosen passed through Burgos, where I could barely wriggle my Renault Clio through narrow streets. He and his friends were sitting in a small square at an 1891 fountain that provided drinking water to the townspeople (and I assume the town’s horses) in times past and is still potable to this day — or so the men told me when I asked in Google-translated Italian if I could drink it. The men had encouraged me to visit a nearby nuraghi, in an area called Foresta di Burgos. I found it marked on Google maps, and drove off down winding roads until I found a worn, peeling brown arrow-shaped sign with what looked like nuraghi symbols on it. It pointed down a dirt road, which was blocked by a chained wooden gate and overgrown with yellowed grass. There were no humans in sight, just horses, cattle and those striped donkeys grazing in a rolling field of yellow wildflowers. So I clambered through a fence and crunched up the path until I came to a complex of empty buildings. No ancient stone structure in sight. 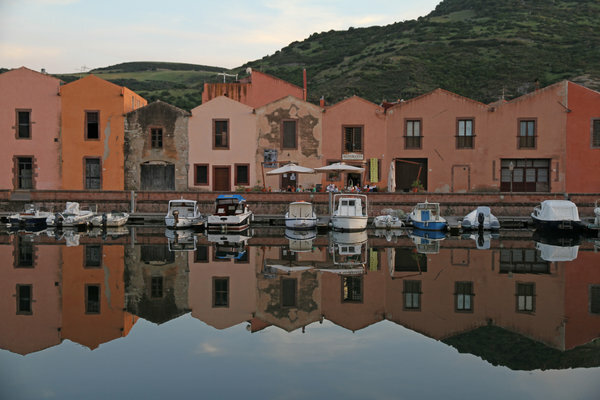 Midafternoon, I arrived in Bosa, a love-at-first-sight city. That first sight, which comes as you wind down route “SS-129 bis” toward the Temo River, is a cluster of pastel houses, and above them, a castle far more majestic than the one in Burgos. The town is almost entirely on the other side of the river, which seems odd. But it wouldn’t have in the 18th and 19th centuries, when the tanneries along the near bank that kept the town humming also kept it stinking – a fact I learned at the Museu delle Conce (3.50 euros), housed in one of the old tanneries. But the smells are long gone and the town is now a delightful warren of medieval streets and alleys and squares and passageways, so haphazard at times that I was reminded of the back passages of Brazilian favelas. Just as well. Bosa is better suited to wandering, talking with the old women sitting in doorways embroidering (and selling), and eating at restaurants like La Locanda di Corte, tucked away in a practically hidden courtyard. I sat at an outdoor table and had a meaty white lasagna for 8 euros, and seadas, a traditional dessert fritter filled with cheese and lemon zest and brushed with honey, for 5. Alas, many of the B & Bs charged 50 euros and up. But at the edge of the historic center, I found La Torre di Alice, run by a young couple named Marco and Alice. Marco, holding his six-month-old son, offered me a room for 35 euros with breakfast. It was lovely; I sat down right away at a little wooden writing desk to gather my notes. The charming but hard-to-use old-fashioned skeleton keys were balanced out by a Spotify mix of Dylan, Springsteen and the Who, which played during my lovely breakfast of fruit salad, cream-filled pastry and espresso. The next day I headed to Alghero, a town notable for Neptune’s Grotto (caves extraordinarily located in isolated cliffs at water’s edge) and its Catalan-speaking population, itself extraordinarily far from Catalonia, the lingering result of a 14th-century expulsion of local people by the Catalan king, Peter III. I eschewed a 16-euro boat trip in favor of a 654-step staircase built into the cliff, admission 13 euros. I spent the savings at Il Milese, a bustling sandwich shop with outdoor seating, on a 2.50-euro focaccia Milese, freshly made with tomato, tuna, pancetta, anchovies, hard-boiled egg and arugula. It wasn’t the only bargain I found in town. I returned to my car to find a 50-cent parking ticket on the windshield. The best deal on the island was yet to come: a startlingly great deal for room-and-half-board at an agriturismo, or farmstay, at the southern end of the island. But that’s a delicious story for a future article.